I'm just going to get it out of the way up front. These are not "the one". 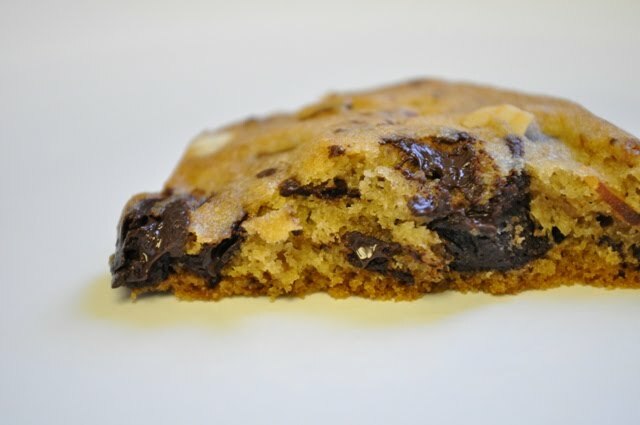 You know, the perfect chocolate chip cookie that everyone seems to be searching for? 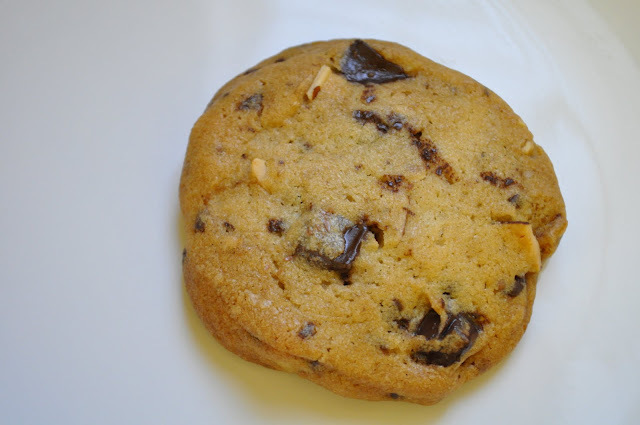 I have been wanting to bake Melissa Murphy's Chocolate Chip Cookies with Toasted Almonds since I joined Sweet Melissa Sundays five months ago in hopes that perhaps, these would be "the one". I opted out of baking this week's recipe for Sweet Plum Clafoutis with Almonds selected by the very talented Michelle of Flour Child. Many bakers related this recipe to breakfast, pancakes and french toast...none of which I'm crazy about. 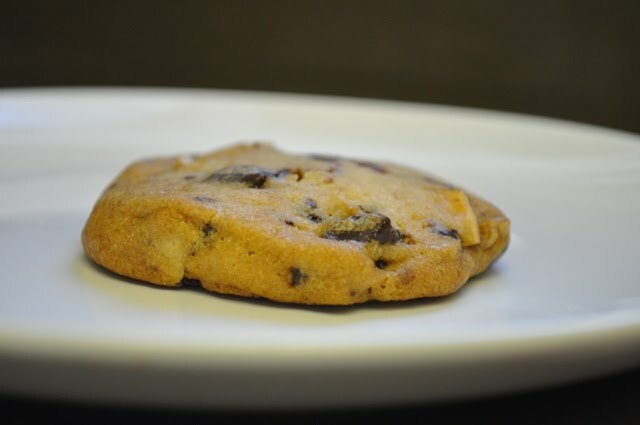 So I seized the opportunity to do a rewind recipe since I was not a part of the group when these chocolate chip cookies were selected last year. Don't get me wrong. These are still tasty cookies--especially with a glass of cold milk. I won't have any trouble at all eating them. Luckily most of them are designated for one of Hubby's business contacts which is good for my waistline. I did make one alteration to the recipe. I used 2 ounces of milk chocolate and 6 ounces of dark chocolate (rather than all dark chocolate). I know milk chocolate isn't the "in" chocolate at the moment, but I really liked the extra hint of sweetness the milk chocolate brought to these cookies. They had a slight crunch on the outside and soft chewy center. Though I would have liked to have taken them out of the oven 1 minute earlier. I checked the cookies at 10 minutes, 13 minutes and then took them out at 15 minutes. So when I bake up the rest tomorrow...13-14 minutes is my target. For the recipe click here. Melissa Murphy herself selected the recipe and baked along with the group back in 2009. Pretty cool! In my quest for "the one" I have read that allowing the dough to sit for at 24 hours gives the opportunity for the brown sugar to really meld with the other ingredients and bring out another depth of sweetness. Since I'm baking up the rest tomorrow...I'll test out this theory and see if the flavor develops. In the meantime, my quest continues in search of the "the one"! Gloria, I totally agree with looking for perfection. Have you tried the Cook's Illustrated? My daughter likes that one, and it's the one I make most frequently, as it is easiest. My fave is the Jacques Torres courtesy of NY Times, which uses a combination of flours and chocolate fevres. I'm going to be trying the Levain Bakery one next. I love combining two chocolates, and I must say that yours look perfect and scrumptious! Your cookies certainly look fantastic! These look so good! 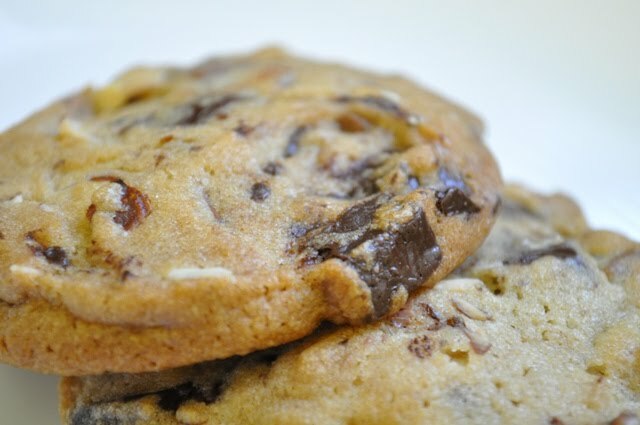 I need to try some of the great chocolate chip recipes available these days. I can't remember the last time I made chocolate chip cookies. I really enjoyed these cookies when I made them a couple of months ago. I too didn't think they were the "best" but they were still good. Yours baked up really nice. Those look like some great cookies. 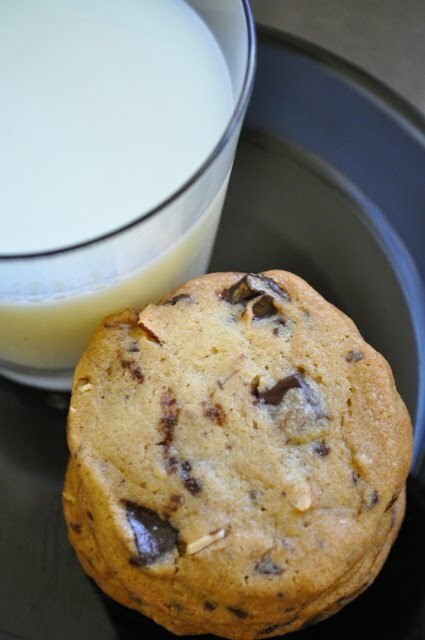 I love almonds in chocolate chip cookies.